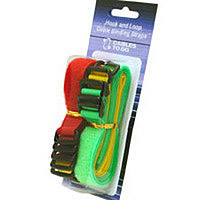 Cable Wraps for managing all those dangling cables. Effectively bring order to the cabling on your audio/video equipment stack, computer desk or in the networking closet. 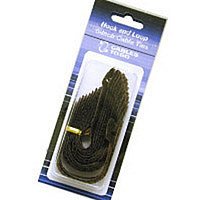 These superior quality nylon ties are easy to use and reuse with their self-attaching, hook and loop design. A selection of three colors (including bright red, black, or brown) lets you organize your cable runs. • Code your cables with three unique colors for maximum efficiency. • Constructed of high-strength, nylon hook and loop to securely organize cables. 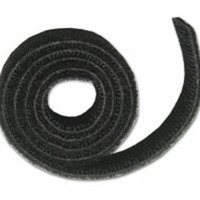 • Six inch tie length holds approximately 1.125 inches in diameter of cables. Painlessly organize the cabling on your audio/video equipment stack, computer desk or in the networking closet. These superior quality nylon binding straps are easy to use and reuse with their solid nylon buckle and self-attaching, hook and loop design. A selection of nine vibrant colors helps organize your cable runs. • 12 pieces per package - enough to do your computer and AV • systems! • Eleven-inch strap length holds approximately 2.5 inches (diameter) of cables. Custom cut the length you need and save money!